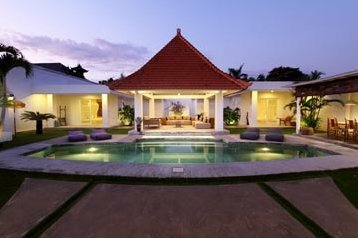 Villa Mitsouko is located in the heart of Seminyak, Batubelig area, which is well-known for its bars, restaurants and shops. The beach is only 10 minutes away by walk, perfect for enjoying the beautiful Balinese sunsets. This charming 4 bedrooms property is a perfect mix of modern and traditional style, with local architecture and decoration. The main room is a Joglo (traditional Javanese house) which shelters the kitchen, dining room and living room. On each side of this Joglo, you will find two spacious bedrooms with its en-suite bathrooms overlooking the garden. The other two bedrooms are located in front of the main room. All these bedrooms are air conditioned and featured with en-suite bathrooms. Outside, you will discover a large tropical garden with a beautiful pool and a small whirlpool. All the sun beds will allow you to relax during your stay in Bali. The unique charm of this villa will seduce you and will make your stay unforgettable on the island of Gods. Do not wait to book, fly now to paradise! You have review for Villa mitsouko?